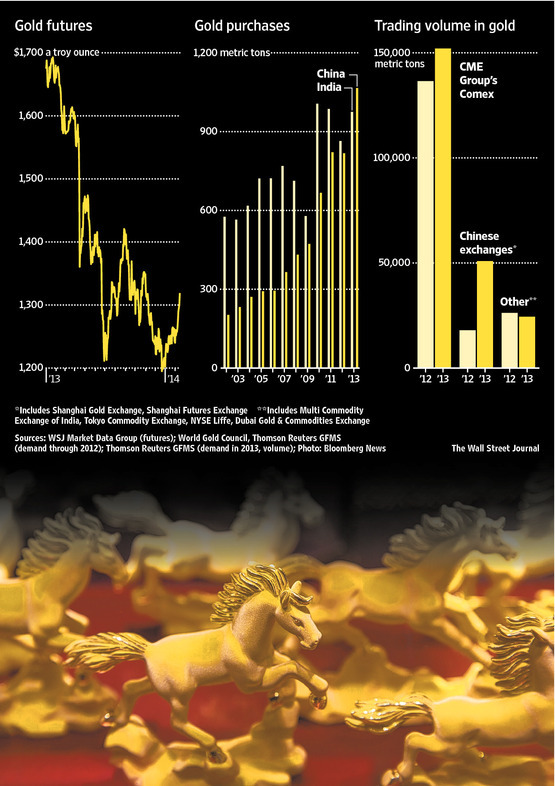 Chinese demand for gold bars, coins and jewelry soared by 32% to record levels in 2013, even as the price of gold slumped 28%. Checkout the interesting infographic about the comparison of India and Chinese Gold Purchase.And also compares the Exchange Volumes of Comex Exchanges, China(Shangai Gold Exchange and Shangai Futures exchange) and rest of the Gold Exchanges(MCX,Dubai Gold Exhcnage, NYSE Liffe, Tokyo Commodities Exchange. China is taking over the world one gold bar at a time as this new world superpower reacts to years of being on the receiving end of the US dollar and Fed money printing. In the MUST SEE infographic below, learn how in the space of a few decades, China has opened up her huge gold market, which is now hungrily devouring the world’s gold.